We digested miniprep samples with xbaI/pstI fast digest enzymes in order to determine if ligation was successful. Digestion mixes were placed in 37°C water bath for approximately 1 hr. 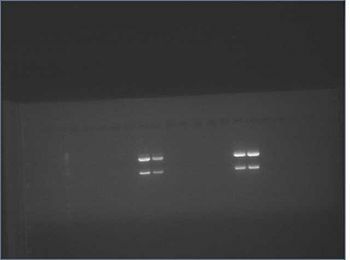 We simultaneously digested PCR purified pENTCUP2, NosT, and NosT & stop inserts with xbaI/pstI. This way if the above digestion showed the ligation of the inserts into v0120 backbone was not successful, we can continue with these inserts. Placed in 37°C water bath for 20 minutes. Also see pages 22-23 of the QIAprep Miniprep Handbook for miniprep instructions. put 10x green FD buffer on ice to thaw. 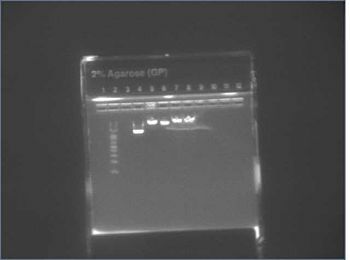 Ran on a 1% agarose gel, 100 Volts for 30-40 mins. 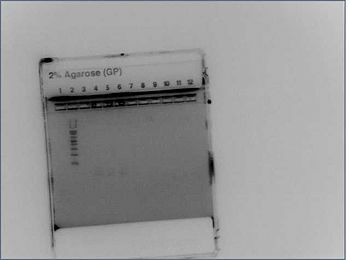 Cut out the backbone (upper band, and placed into four eppendorf tubes, labeled 'B21 backbone' and with their respective weight before the gel was added. Placed all four in the iGEM team fence box in the -4°C freezer to be purified tomorrow. Designed primer sequences for ACC synthase degradation site, linker sequence connecting Barnase to the degradation site. Designed primers to amplify germination/embryogenesis promoter and AtArp2 promoter. This page was last edited on 26 September 2017, at 19:04.